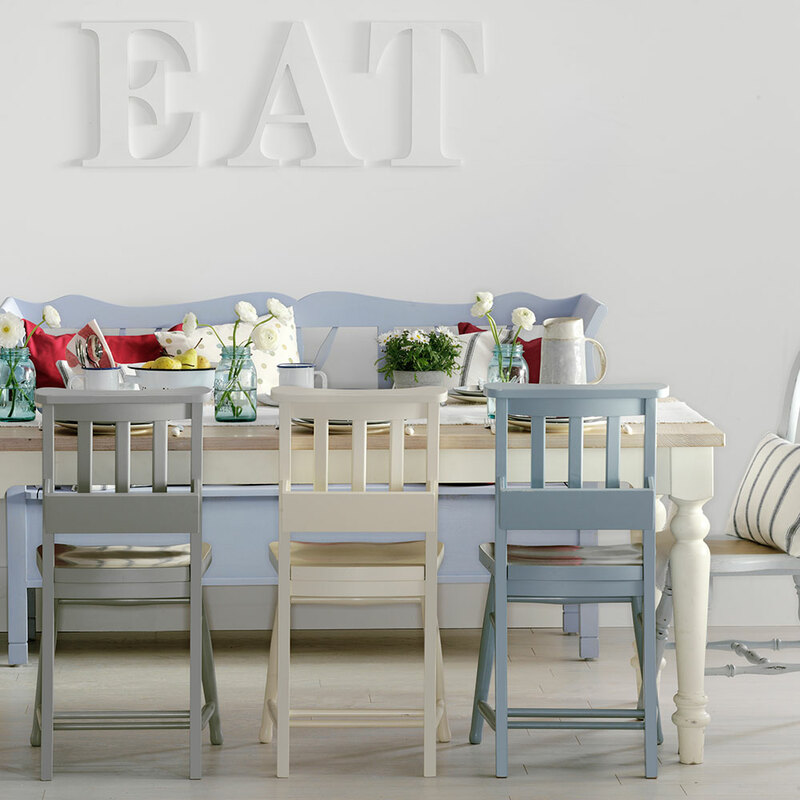 Enjoy our round-up of the most affordable and easy ways to make your dining room more beautiful now. 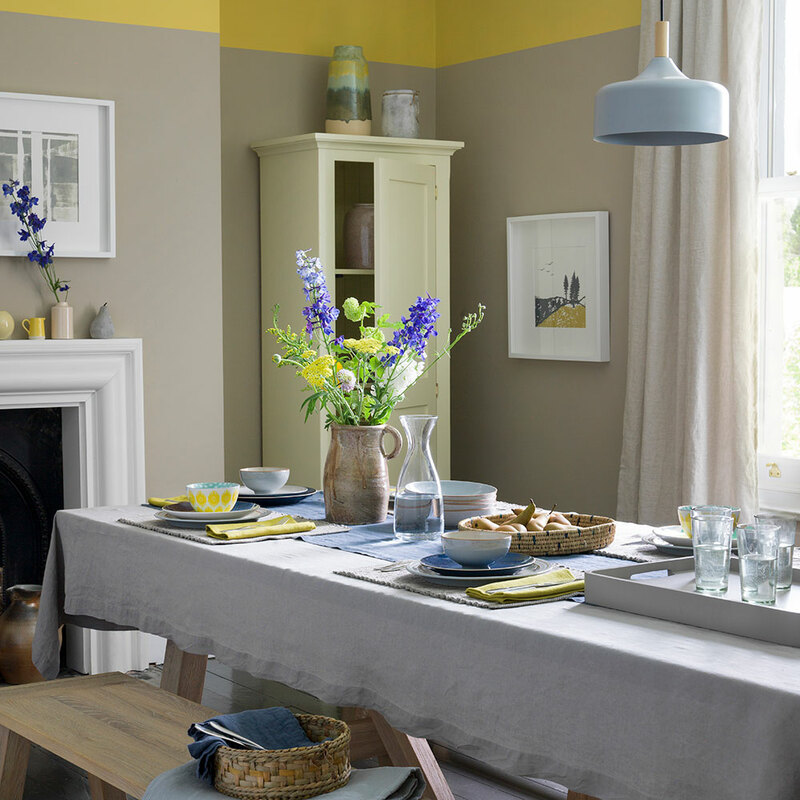 Time, cash and creativity can all be barriers to a makeover – but not in the case of our budget dining room ideas. 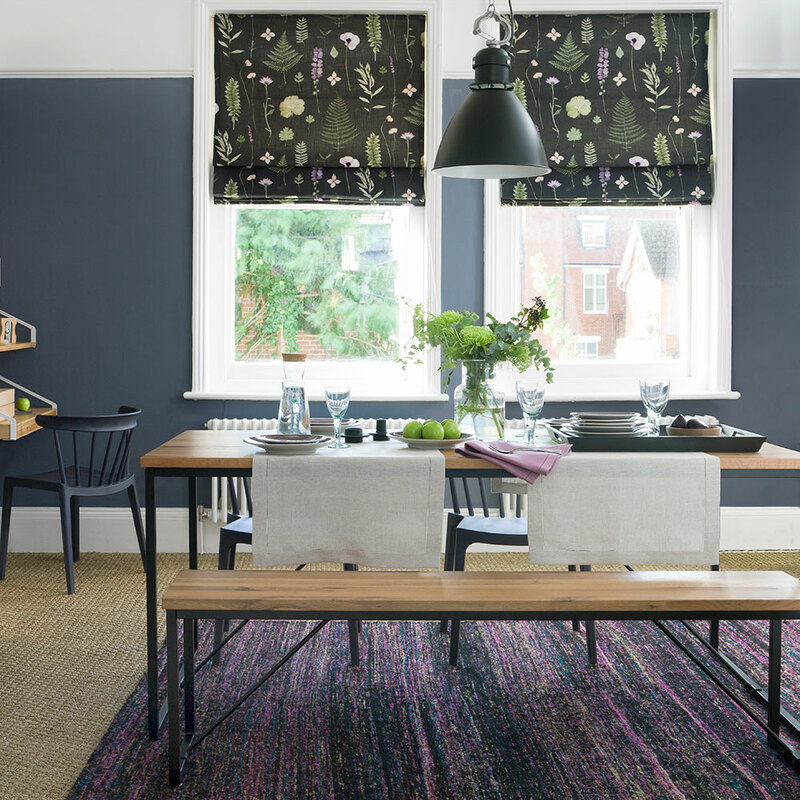 If you want to spruce up a separate room for dining, make an open-plan entertaining space more opulent, or breathe life into a breakfast area squeezed into a corner of the kitchen, you’ll find plenty of inspiration here. All of it quick, easy and – most importantly – affordable. A stylish tablecloth will update a tire table in minutes, covering up scratches and watermarks alike. 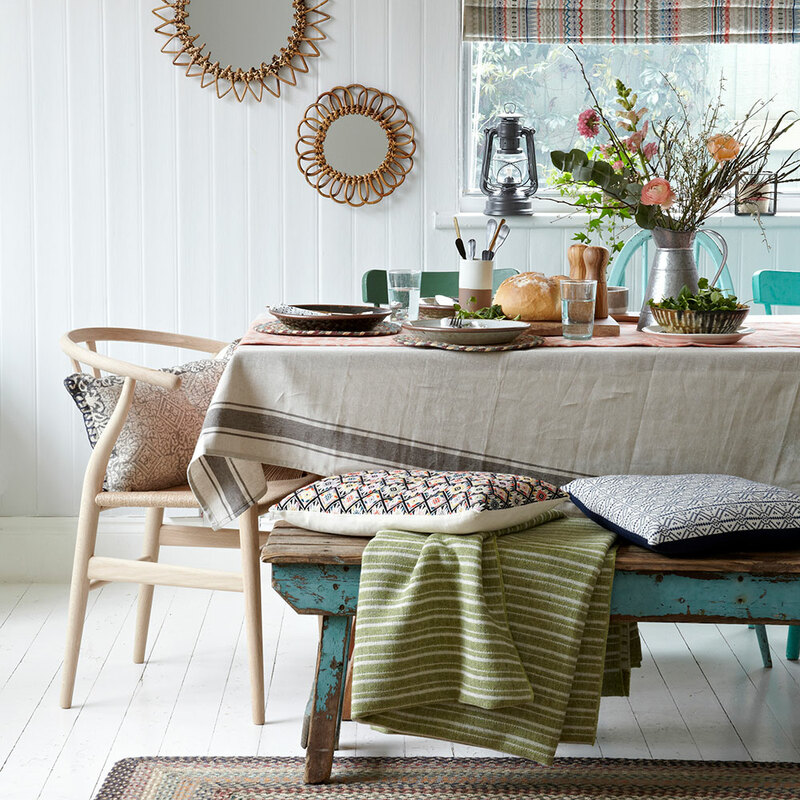 Keep to a natural linen design for a less formal look, or use a runner if you’re worried a cloth might seem to fussy. 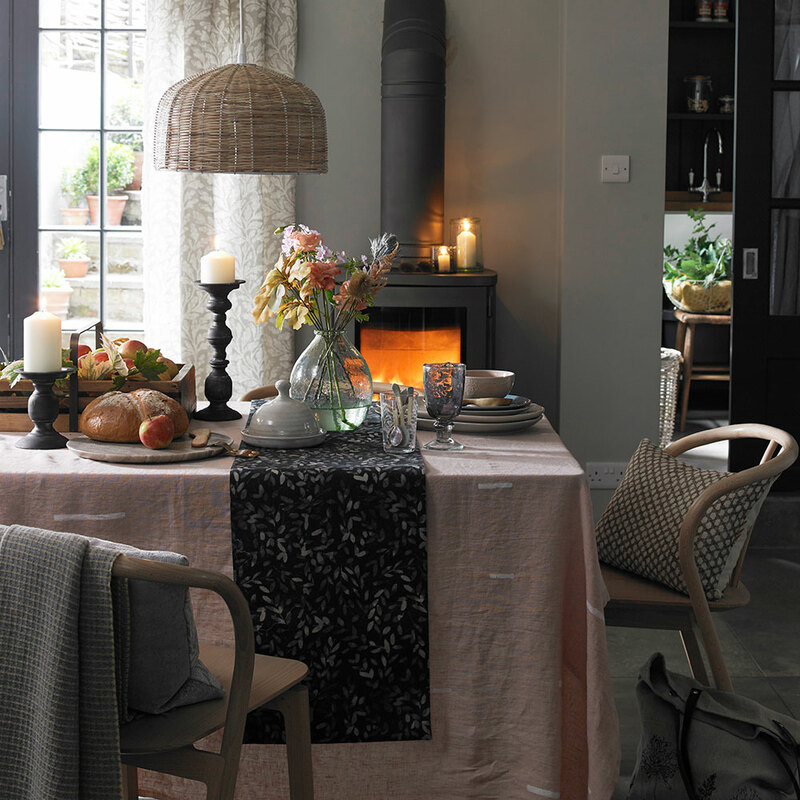 Use napkins and placemats as accents that pick out colours used elsewhere in the room, creating cohesion. Here, blue references out the lighting and crockery and yellow the paint at the top of the wall. Adding a bench that tucks under a table is an affordable way to add extra seating, and a space-saving one at that. 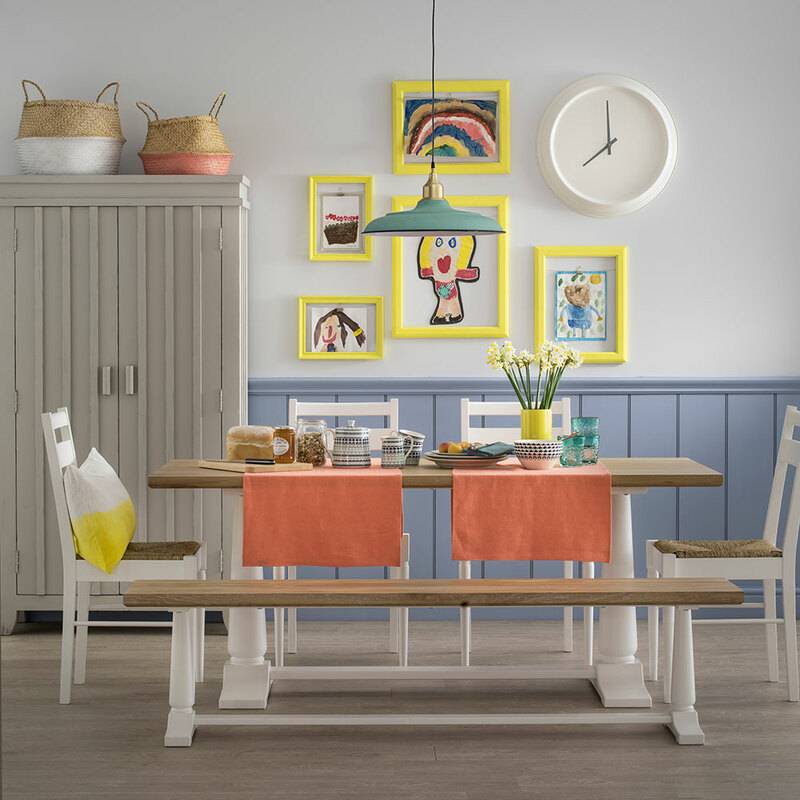 It can look the part in all schemes, too, so whether your room has country-style Shaker cupboards or sleek and contemporary units, a bench could be the answer to fitting the whole family round the table together. For comfort, load your bench with cushions and throws that will encourage the family to stick around and chat long after dessert. Make the windows the focal point of your room by hanging a beautiful blind that demands attention. Go for a Roman blind so that the pattern is always visible. 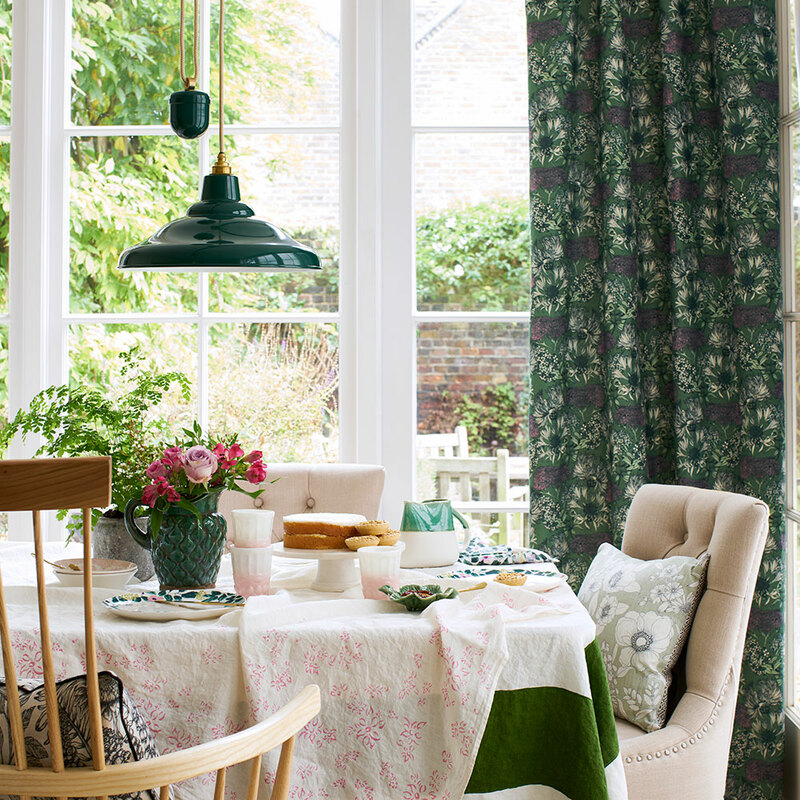 This instant decorating win will double up as a talking point at dinner parties. As a rule, pictures should be hung at eye level, with the centre around 145cm from the floor. However, the viewpoint will mostly be lower in a dining room as you’ll be seated, so hang artwork a little lower, too. Choose a light fitting that suits the proportions of your table – too large and it will overwhelm the space, too small and it’ll get lost. Hang the light low will create a more intimate atmosphere, while picking curtains in the same shade will accentuate it as a feature. Painting the walls black is one of the most inexpensive yet dramatic ideas out there. 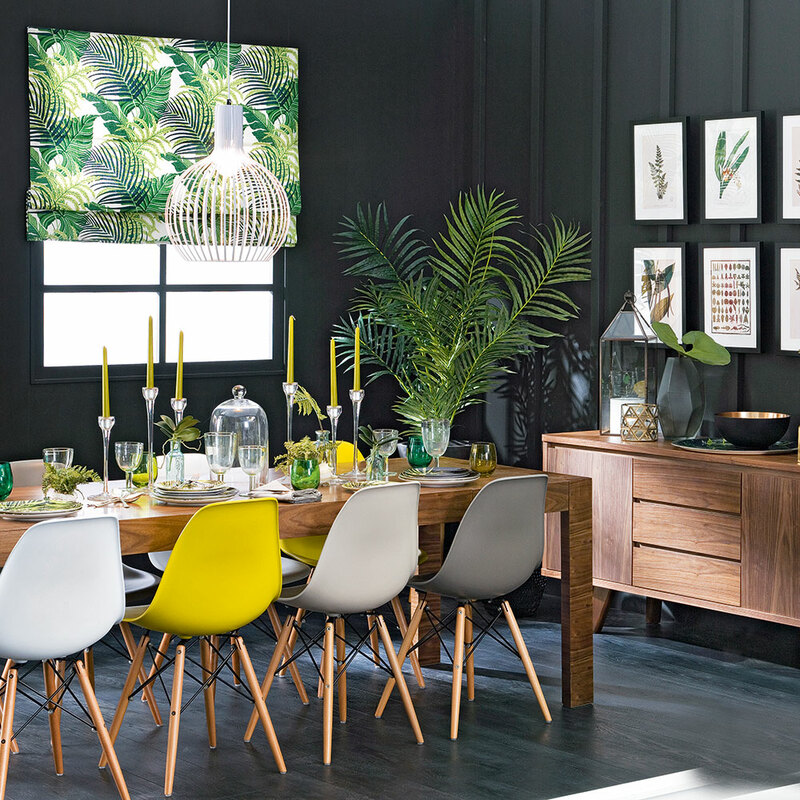 It will instantly make your furniture and accent colours pop, and is a great foil to a smart, tropical-inspired theme. Those lush potted palms and botanical artwork are other affordable additions. You can pick up wooden chairs at charity furniture shops and furniture shops for just a few pounds, and they can be easily transformed. Start by washing the chair and then sanding it down. Next apply a primer. When it’s dry, apply your chosen colour in several light coats to avoid drips. Finally, apply a water-based clear protective finish. Old church chairs make particularly good dining chairs in an open-plan space, thanks to the bible storage at the back. Use chair pads to make wooden seats more comfy. If you can’t find any designs you like, recover plain ones with striped line tea towels for a French rustic look. Who needs to spend hundred on art prints, when you have your own little Picassos at home? Set up an artist’s studio on the dining table and get the kids to paint or draw some originals for the wall. Keep it classy by sticking one medium – so poster paints or crayons, not both – and by hanging each one in the same coloured frame. But have fun with the colour – this sunny yellow is far more suitable than black. Related: What smells will sell your house? We all know that candles can create a romantic mood. But avoid overpoweringly-scented candles at the table. Opt for natural beeswax instead – the subtle fragrance won’t compete with the smell and taste of your food. Alternatively, use unscented candles and add rosemary sprigs, berries and pine cones to fragrance your dining room.